Belmond Eagle Island Lodge Reservations. Call 020 7962 9933. Stay for four nights at the wonderful five-star Belmond Eagle Island Lodge in a secluded retreat on the lush waterways of the Okavango Delta and enjoy three days of game drives. The lodge consists of well-appointed and designed tents and makes a perfect safari escape. 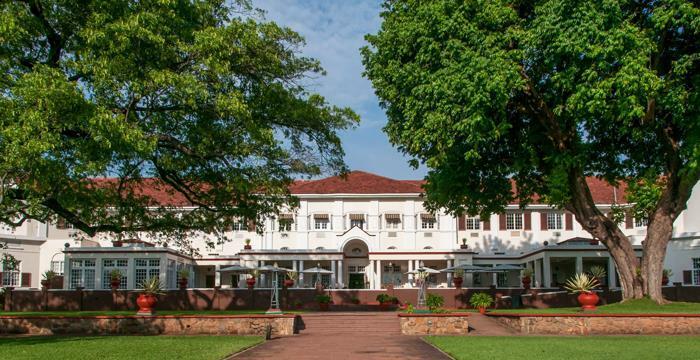 Transfers are included in the price of this memorable trip which also includes a three night stay on a B&B basis at the iconic Victoria Falls Hotel and a three night journey on Rovos Rail, one of the world's most luxurious trains. The luxurious 5-star Belmond Eagle Island Lodge is a secluded retreat on the lush waterways of the Okavango Delta, on Xaxaba Island. It consists of well-appointed and designed tents overlooking a tranquil lagoon teeming with fish and extraordinary birdlife, offering unrivalled service and amenities, for the perfect safari escape. The lodge is a 20-minute drive from Maun airport, which can be reached by flight from Johannesburg. Eagle Island Lodge’s 12 luxury tents are housed on raised wooden platforms and shaded by a traditional African thatch roof. Private decks are furnished with easy chairs and a hammock, while in-room amenities include an en-suite bathroom, four-poster bed with mosquito netting, fully-stocked mini bar and discreet air conditioning. The private suite set away from the main tents offers a more intimate safari experience, and offers a secluded deck, a generous splash pool and an open-air bathroom. Take an invigorating game drive to spot the Big Five and learn about the local area. Walking safaris, canoe trips, fishing, bird watching, local village tours and a helicopter safari can also be arranged. At the camp, take a dip in the lodge’s 20m outdoor pool or kick back on the main deck. The lodge’s skilled chefs prepare delicious local and international cuisine throughout the day, from morning coffee and breakfast before your game drive to healthy lunches. Dinner is served on the outside deck, around a campfire or at your room, while the romantic Fish Eagle Bar makes the perfect spot for a sunset drink or a light snack. DialAFlight you are stars. My sister was very happy with the 'VIP service.' Simply over the moon! All went very well and the hotel you booked in Dubai suited us really well. Lovely freindly and reassuring service, thank you. Belinda Mullet was extremely helpful. Great customer service - have already recommended to others. Josh and his team always deliver. Excellent advance arrangements, all meetings punctual. No fault of DialAflight but appalling service from Virgin. Return flight from Johannesburgh to Heathrow cancelled twice - 2 nights in hotel - should have landed Saturday 15th April 06.35 - finally landed Sunday 16th April 21.35! Thank you for great service at a competitive price. Appreciate the courtesy calls and attention to detail. Thoroughly happy with your service. Only one tiny niggle which is not down to you - why do airlines put couples in the centre of the four seats - not fair! You gave me a change of time to my second flight which other people hadn't had which was useful. There is a sense of confidence that if there is a problem with the flights someone else will sort it. I always contact Marion as she consistently finds me the most economical and reliable flights. She has a wealth of knowledge and her expertise benefits me tremendously. Absolutely perfect - could not have been better organised. Really helpful and professional service from Ronan. Contacted you as we were very impressed by the service given last year when my son went out to Botswana. Rocky was more than helpful. Great personality. Delighted with the service I received. Everything went well. Many thanks! Once again everything was superb. Why would I ever book through anyone else? Thank you Isla. DialAFlight is a reliable company. I will recommend all my friends to you. Keep up the good work and keep the trust you give to your customers. With DialAFlight,you travel with confidence.